Using suitable air conditioning tools will greatly enhance and speed up the work of servicing or repairing HVAC equipment. Some of the hand tools that service technicians use to work with include wrenches, pliers, hammers, screwdrivers, mallets, vises, taps, twist drills, dies, chisels, hacksaws and files. Learn more about these tools and you will be able to ask intelligent questions to the service technicians if need to. Hacksaws are used to cut copper tubing or other work that requires metal cutting. Most saws have a range of blades that can be fitted depending on the type of metal you are cutting. Different type of blades have different numbers of teeth/inch. Use more teeth/inch blades if you are cutting thin or hard metal. If you are looking for better blades quality, settle for tungsten or molybdenum steel alloy. Pliers are common tools that most household has. They are usually made of alloy steel and can be used to cut wires. Slim nose type is used when you need to reach crevices or small opening equipment. Hammers are useful air conditioning tools to fasten or remove nails besides providing the force needed to connect two separate materials. A 16-ounce ball peen hammer is commonly available in hardware shops. Wrenches are used to fasten nuts to the bolts. HVAC fasteners are usually made of copper or brass, hence they are soft and require suitable wrenches to fasten or loosen them. 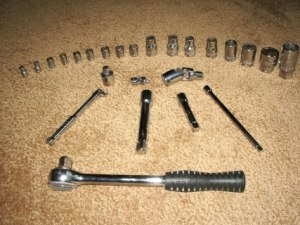 Wrench types include Box, Socket, Open-end and Adjustable. Box type is strong and grip nut/bolt tightly.Socket type is tbe easiest to use if space permits it. The Standard 12-Point Sockets are usually made of chromium-vanadium steel and is common household tools that you probably have.Open-end type is able to easily slide on the nut or bolt. Typical sizes for HVAC use are 1" across flat that fits 1/2" flare nuts, 15/16" across flat, 5/8" across flat, 1/2" across flat, 7/16" across flat.Adjustable type is able to use on various sizes of bolt and nuts. The setback is that the grip may not be tight and can cause damage to the bolt/nut. Screwdrivers are common tools in the house. Typical types are Philips bit, Cabinet Bit and Keystone Bit. Others include Allen Recess, Bristol Recess, Philips U Recess, Bristol Bit and Slotted Screw. Vises are usually available in a typical workshop where they are used to hold parts while you work on them. To prevent damage to the parts under work, use a soft jaw made of copper or aluminium. Twist Drills are used to install or repair equipments. Drilling of wood, plastic, masonry and metal require different kinds of drill. Typical ones are made from alloy steel or carbon steel. Taps are used to make threaded hole in metal parts for machine screws or tap screws to be fastened into them. Tap is made of hard alloy steel. Three common types of taps are bottoming, plug and taper. Taper is used to start a cut on the metal. Plug type is used to cut the blind holes and bottom type is used to cut full threads to the bottom of the blind holes. Dies are used to cut external threads on a round stock. Files are used to clean and smoothen metal surfaces or metal parts. They can be single or double cut types with lengths ranging from 4" to 12".